Today sees the opening of Sawdust & Threads: an exhibition, residency and art installation which will be based at UCL’s North Lodge on Gower Street for one week until Monday 23rd February 2015. Sawdust & Threads is an exhibition that takes objects disposed of from museum collections as its material. After drawing the objects, artist Caroline Wright will carefully deconstruct them, reducing them to their component parts. UCL Museums & Collections is one of three museums – along with Norwich Castle Museum and Art Gallery and the Polar Museum in Cambridge – collaborating with Caroline by contributing objects to this Arts Council Funded project. 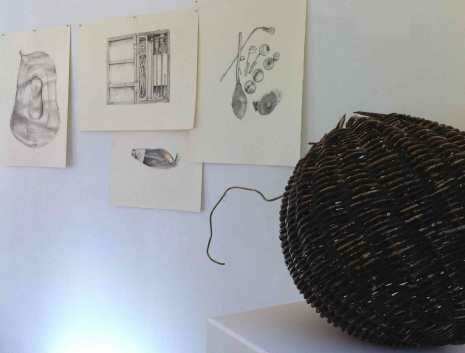 Her drawings will be on display in the North Lodge, and Caroline will be deconstructing the objects from UCL’s Teaching & Research and Ethnography collections in the North Lodge and at the Institute of Making from today.